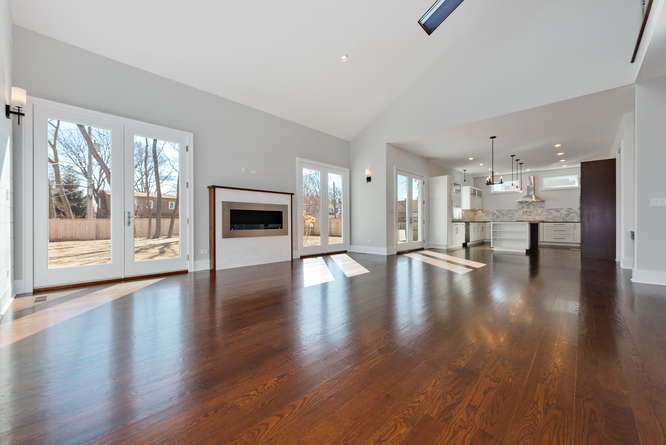 Magnificent custom built farmhouse with over 4,000 square feet of finished living space. 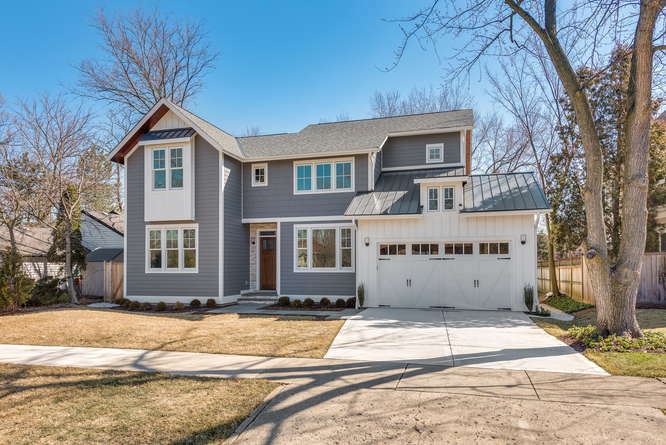 Builder missed no details with this one; a contemporary open floor plan, large rooms, 10′ ceilings, gleaming red oak hardwood floors, custom millwork and other elements blend seamlessly with the abundant natural light creating this ultra-comfortable oasis. 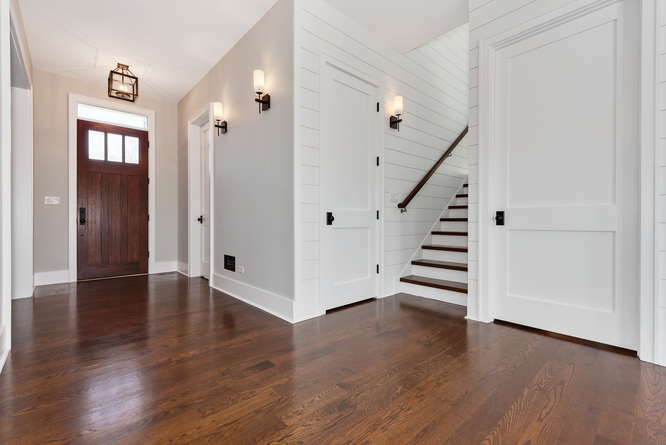 From the moment you enter the home through the grand 8′ mahogany entry, you will appreciate the many unique design features and attention paid to make them special. 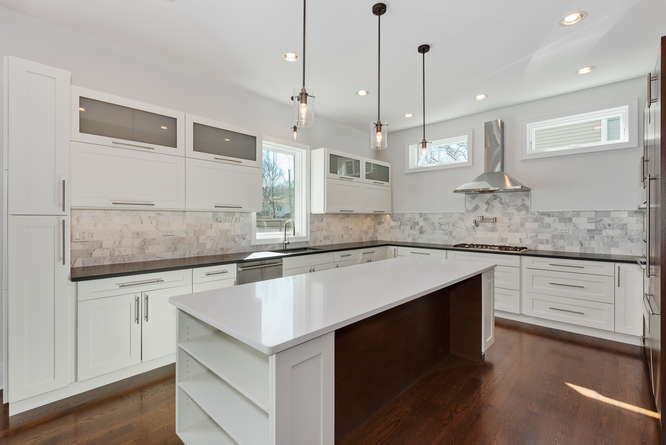 The gourmet kitchen will capture your attention with quartz countertops and 9′ island, hand-crafted Carrera marble backsplash and top of the line Bosch SS appliances. 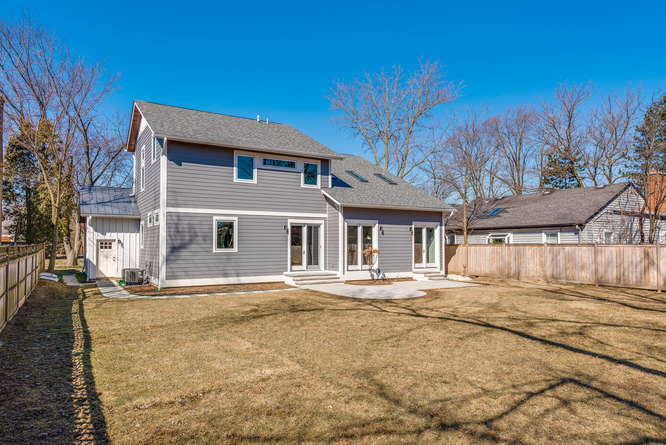 The master suite is spacious with 12′ vaulted ceiling, 2 walk in closets and a captivating spa quality bathroom that is sleek and functional.1st floor en-suite with high end bathroom, 2 other large bedrooms upstairs and finished basement. Big fenced backyard with patio. Walking distance to town, shopping, great parks and schools. Welcome home! 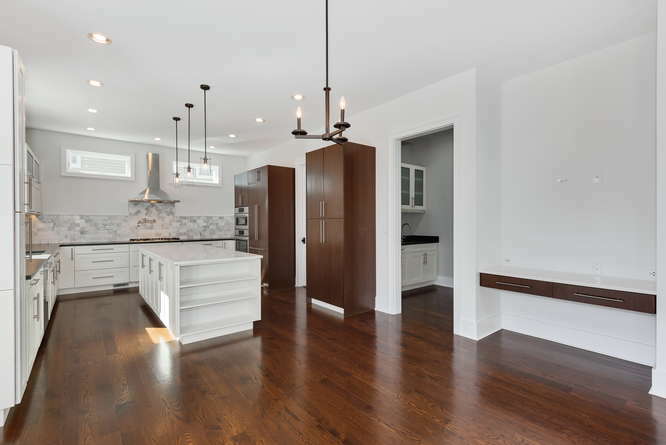 From the moment you enter this amazing home, you will be blown away by the outstanding finishes, starting with the 8′ mahogany doors, gleaming red oak hardwood floors, 10′ ceilings, custom millwork and abundance of natural light. 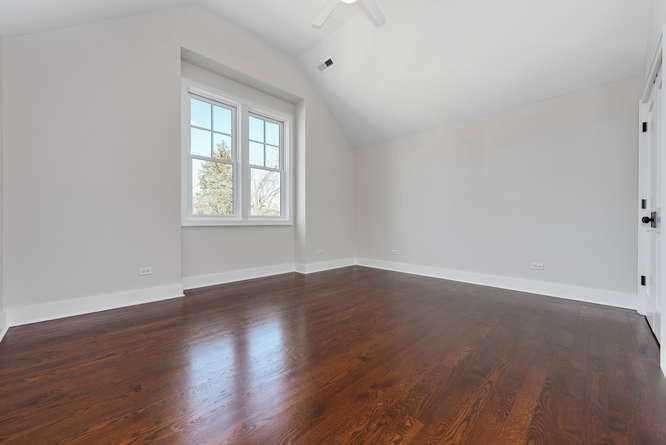 This spectacular open space features 20′ vaulted ceiling and natural light from the backyard and skylights from above. Stainless steel maintenance free bio-thermal fireplace with a mantel crafted from white dolamite marble and oak. 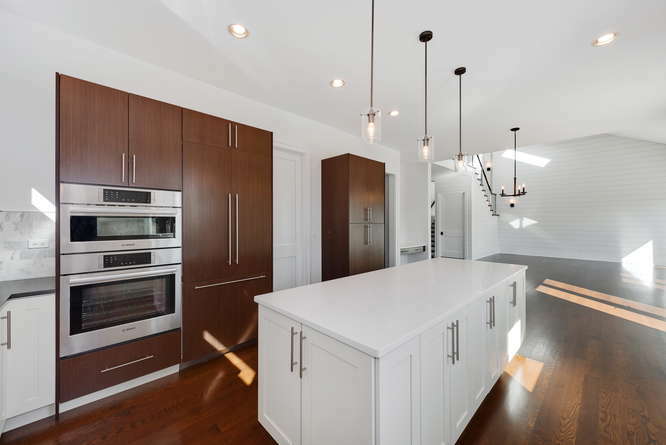 Spacious eating area between the living room and kitchen with sleek light fixture, french doors to the back patio and floating office nook and desk. 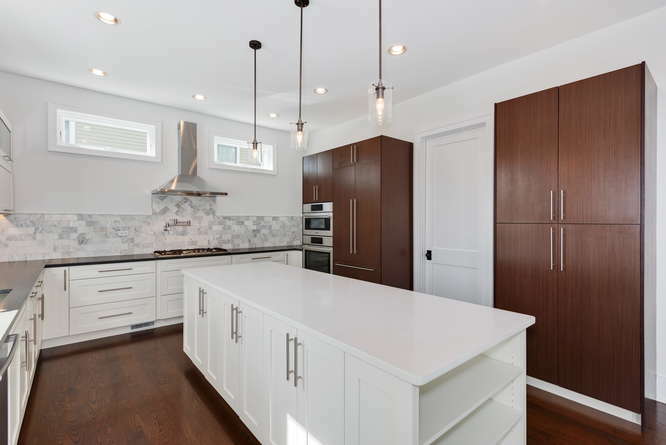 Fabulous gourmet kitchen with two different styles of quartz countertops, high end stainless steel appliances, 9′ island and hand crafted maple cabinets. A good view of the large pantry, built in Bosch refrigerator and Carrera marble backsplash. Bosch oven and microwave and view back to the massive living room. 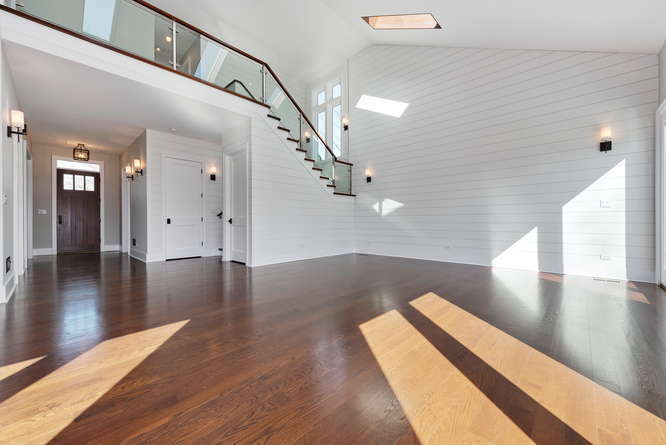 From the back of the living room, you see the entry way, custom handmade shiplap walls and up to the loft. Modern staircase finished with glass, stainless steel and oak. 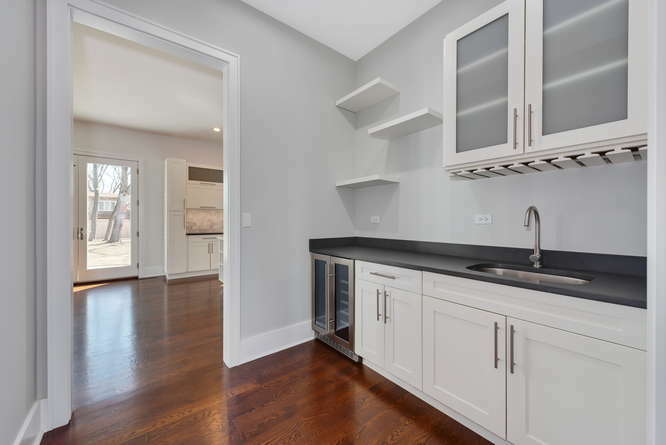 Entertaining will be fun and easy with the butler’s pantry boasting quartz countertop, 5 cubic ft beverage cooler, glass shaker cabinets with wine rack and floating shelves. For all of your large gatherings, the bright and spacious dining room at the front of the home offers great space and comfort. 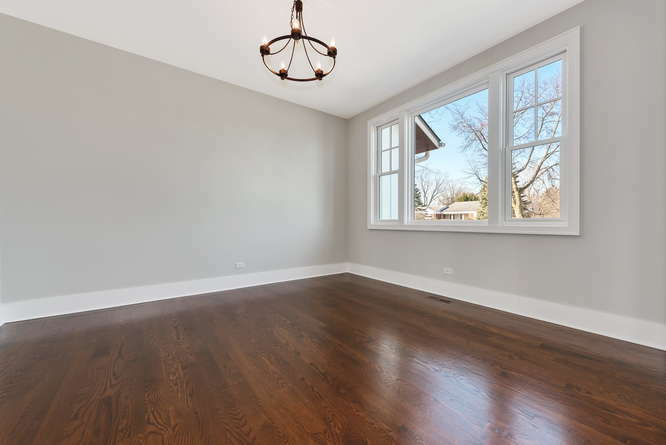 All windows and trim are custom and consistent throughout the home. 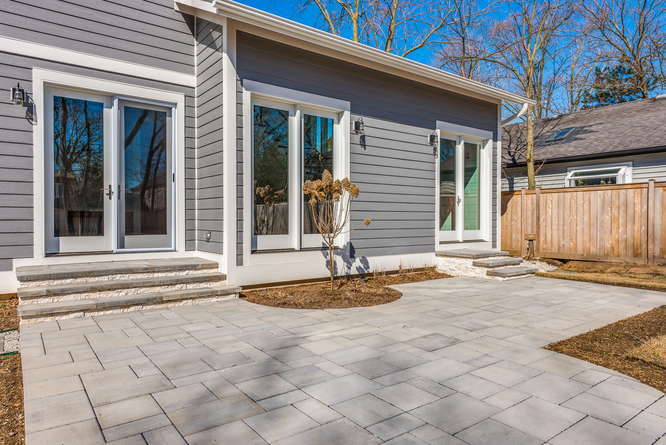 Conveniently located at the entry from the garage, this versatile space offers shiplap walls, porcelain tile floor and handmade bench and utility area. 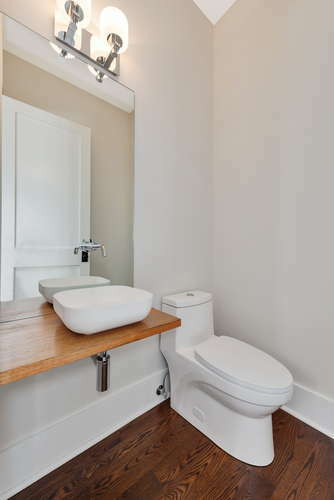 Powder room with floating mahogany vanity, custom single lever sink fixture and dual flush skirted toilet. 1st floor en suite / in law arrangement with ceiling fan, 10′ ceiling, large front window and spacious closet. 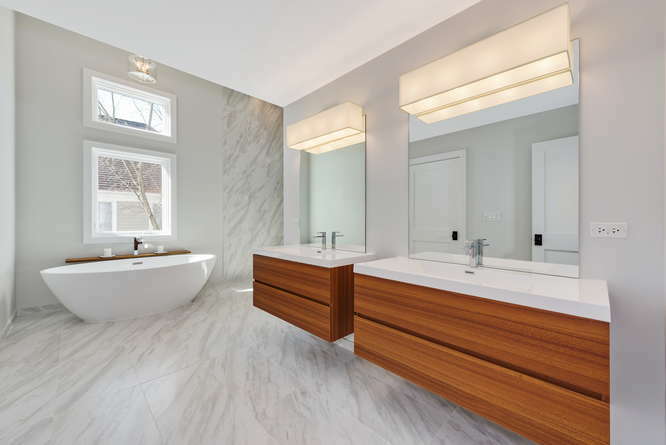 Sleek full bathroom for the 4th bedroom with chrome fixtures and accents, Italian porcelain floor and shower tiles, dual flush toilet and walnut veneer vanity. 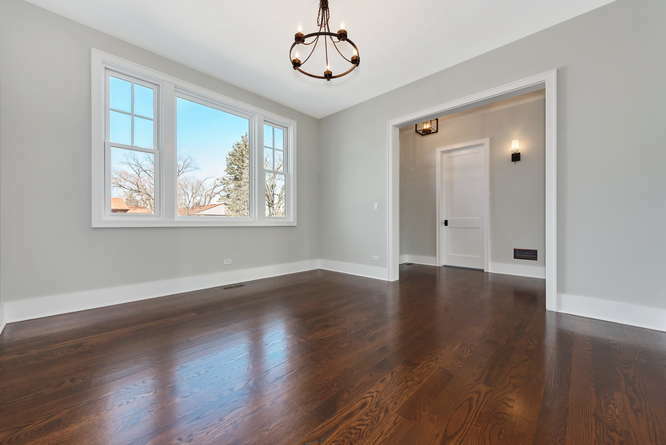 The red oak hardwood floors continue throughout the 2nd floor. From the loft, notice the skylights over the living room with the natural wood trim. Welcome to your oasis! 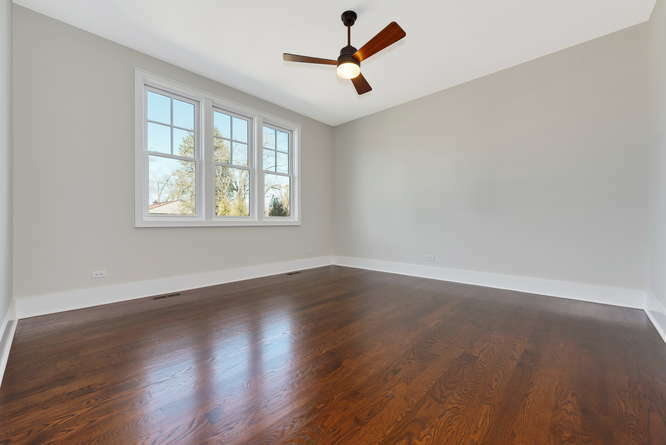 12′ vaulted ceiling with stylish ceiling fan and wonderful natural light. 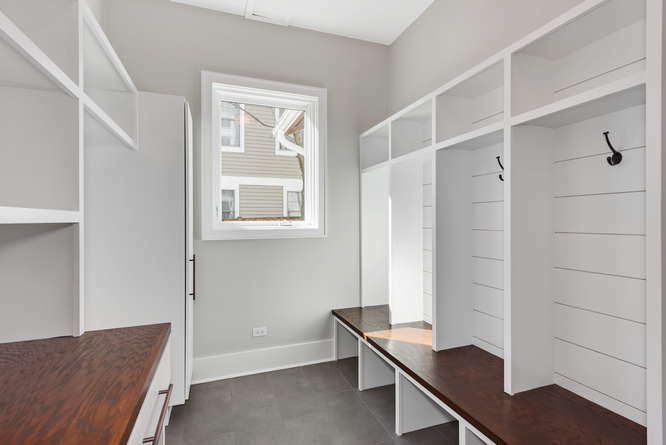 His and hers walk in closets and a master bathroom that might just be the highlight of this magnificent home. 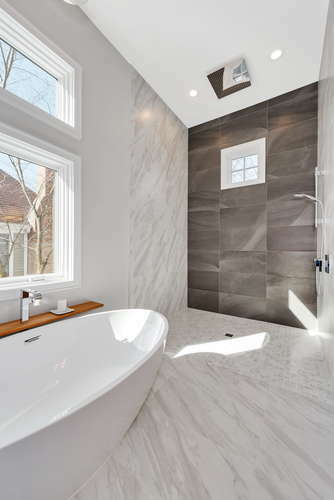 This spa quality master bathroom will take your breath away. 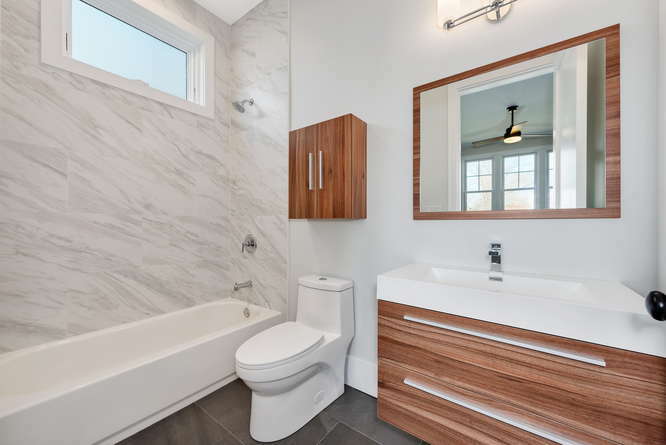 18″ x 32″ imported italian tile floor, teek veneer floating dual vanities, sleek and modern soaking tub and a 12′ wet area and private water closet. The 12′ wet area with 12 1/2″ ceiling shower includes 24″ rain shower – perfect refuge after a long day. 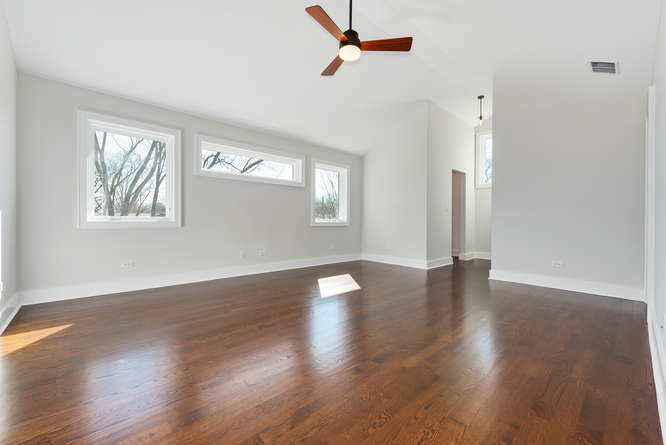 The theme continues with vaulted ceiling and ceiling fan, walk in closet and plenty of natural light. 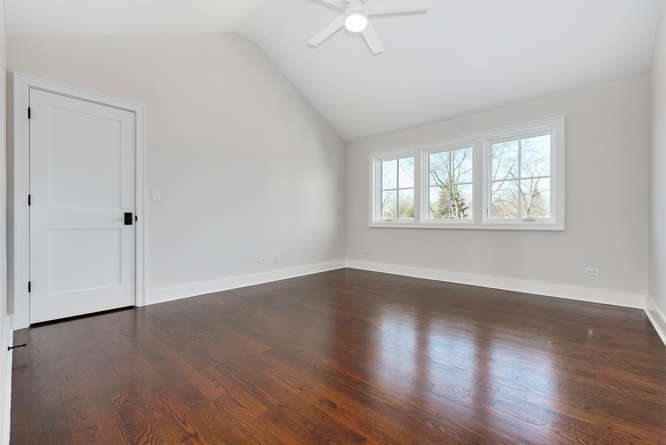 Another bright and spacious bedroom with ceiling fan, vaulted ceiling and two closets. 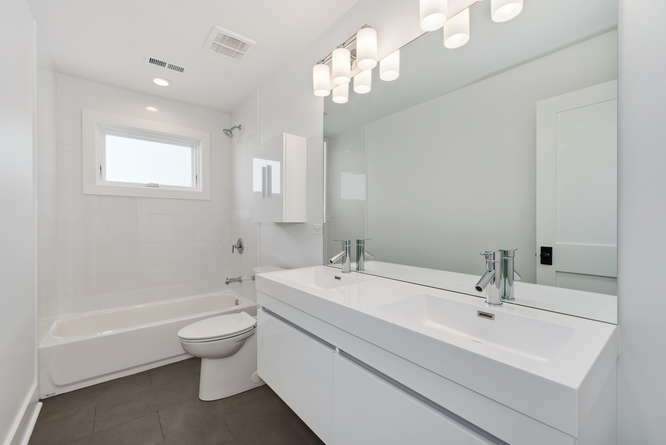 The 2nd full bathroom upstairs is bright and clean with porcelain tile floor, double sink and vanity, matching medicine cabinet and beautifully tiled shower and tub. 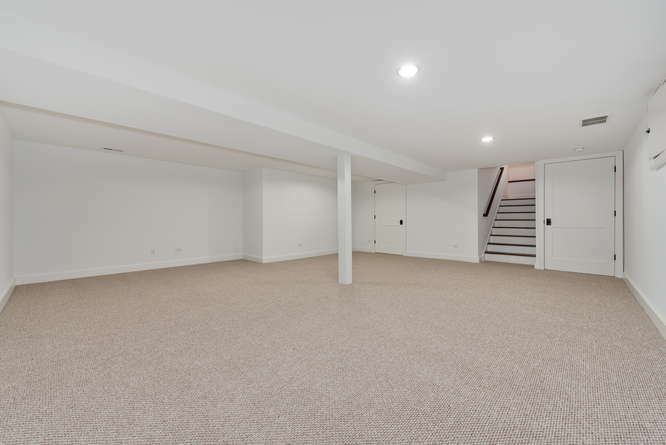 Down the solid oak staircase is the basement with sizable rec room perfect for a playroom for the kids or the ultimate media room. The 19×9 storage area with 2 sump pumps, new 1 1/2″ water service, 220 amp electrical and 2 hot water lines. Great entertaining space in the back yard with permeable paver patio with blue stone and crushed rock walkway. 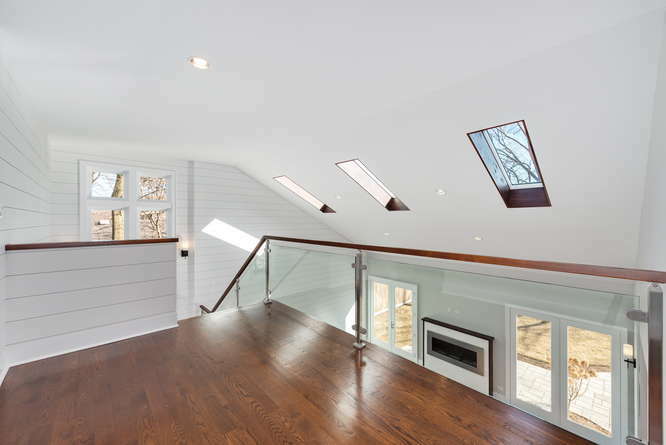 Custom wood soffits and wood siding are just a few of the details that are sure to impress. Big backyard with 6′ cedar privacy fence. A perimeter drain system with 6 inlets into the storm sewer will keep your property safe and dry.